Press binding is flexible allowing add/remove sheets of paper to your printed document. Press binding is a type of flexi adjustable binding using a unique lock made of durable plastic. The press binding service uses Unique Lock, which is a superior quality plastic bind to make your documents look high quality finishing. 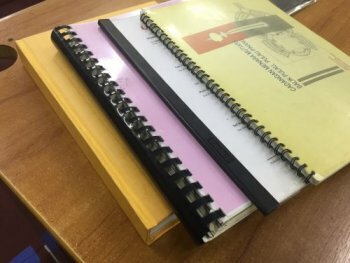 Press binding service is cheap, yet Non-Permanent, which allows customers to add/remove new sheets of paper documents/notes via a Do-It-Yourself kind of thing. Super worth the value if you’re a student, working professional that has many printing documents to manage, and add/remove. At our Kuala Lumpur and Petaling Jaya printing shop, press bind, type of binding service using unique lock binder. Unique lock binding services is offered in our Kuala Lumpur Digital Printing Shop, and also our smaller branch digital printing company in Uptown Damansara Uptown Petaling Jaya.